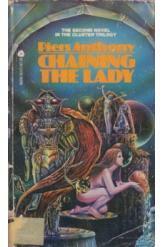 Chaining the Lady by Pier Anthony, Sci Fi. Shapeshifting earthwoman Melody of Mintaka must defend the peoples of the Cluster against the Andromedan fleet. But first, she must survive slavery and humiliation. Book two of "The Cluster" series.